This revelation about my ancestry is coming sooner than expected. On Saturday I did some research at the Schomburg in Harlem. I was only there for about 1.5 hours. I spent at least ten minutes of that time shaking and in tears…the super duper happy kind. Back to Africa kind of happy. I went with a focused mission. In an attempt to tie up some loose ends before heading south, I wanted to take a look at a book my great grandfather, Charles Sumner Long (my mother’s paternal grandfather), wrote back in 1939. Since he and his father were both prominent leaders in the A.M.E. Church in Florida, it makes sense that the book is about the history of the church. I recently purchased and read a book about this same history, which made numerous references to Charles’ father, Thomas Warren Long. I have also come across numerous references to Charles’ book. But unfortunately, it’s no longer in print and can now only be found on microfiche. Hence my trip to the Schomburg. My expectations weren’t too high. I suspected the book would carry a neutral tone and as the author, Charles wouldn’t go into much detail about his family. So when I saw a photo of Charles on one of the first pages (I had never seen his image before), I was satisfied and felt my 1.25 hour-long trip to Harlem was worthwhile. I set myself up with a well-funded copy card, prepared to print any page that made reference to anyone with the last name Long. I scrolled through the book, zooming, straightening and focusing the film almost obsessively. I printed various pages with tidbits about Charles and his father’s role in the establishment of numerous churches in Florida. Somewhere in the middle of the book, between two chapters about a black bishop and a black politician, Charles wrote a brief chapter about his (and my) family history. I started crying as soon as I read, “He was the slave of John Roberts…” It felt like striking genealogy gold. Can this even be real?! He dumped so much information on my lap that it took me some time to process. In all honesty, after I printed the page, I had to put it out of my mind just to regain the capacity to get through the rest of the book. 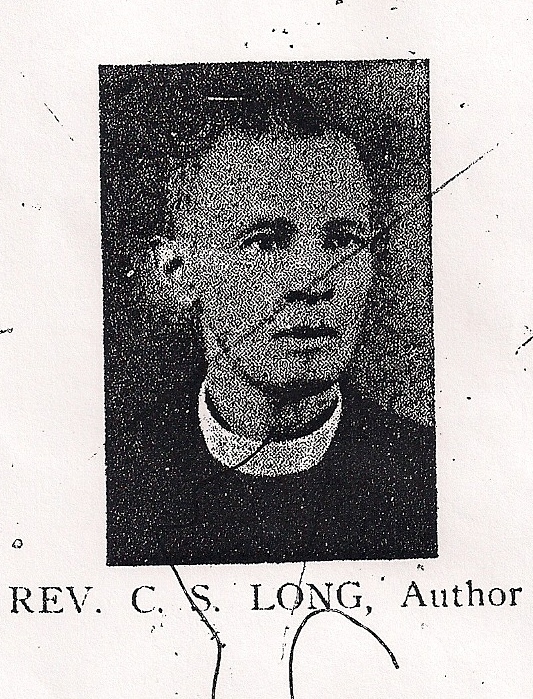 And not until I left the library did I fully digest exactly what I had learned about James Long, as well as Thomas (though I already had a small bit of his story). I’m still digesting it, really. First of all, most people assume that if their ancestors survived the slave trade, they came from the west coast of Africa. And since the Zulus are from southern Africa, not many people are even aware they fell victim to slave traders. But it happened, and apparently not so infrequently. According to the Trans-Atlantic Slave Trade Database, between 1783 and 1825, 25,477 were taken from southeastern Africa to Cuba alone, (21,038 disembarked). Although his circumstances were less common, my third great grandfather certainly wasn’t alone. The Spanish trade to Havana, Cuba started in 1789, which is perhaps right before the time James would have arrived. And apparently Matanzas was big on sugar production. So I can make the assumption that James was working on a sugar plantation. Beyond that, I can’t even begin to imagine what he experienced. An entirely new area for research has opened up. Although I have found an African ancestor, which for many would be the jackpot that brings such a project to a close, there is so much more work to be done. I need to catch up on these areas of history that I previously had no idea related to me. As far as the Longs, there is one big, gaping hole in the story. 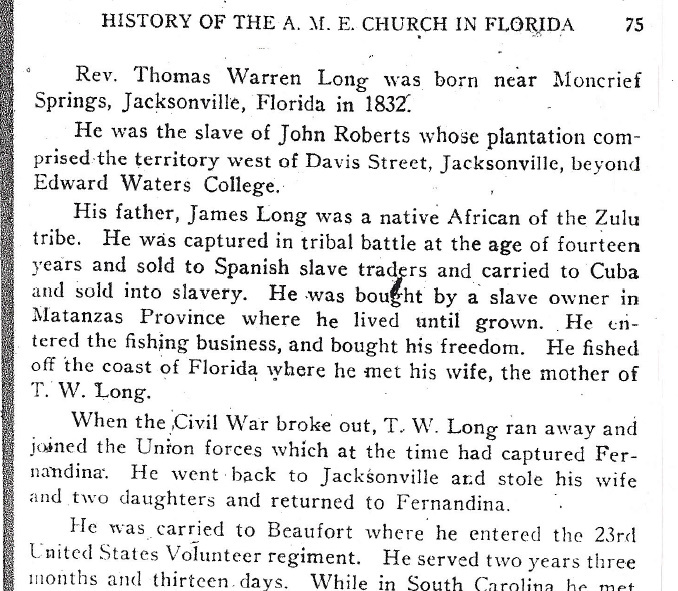 If James purchased his freedom in Cuba and moved to Florida, under what circumstances did his son come to be enslaved? Was he also re-captured into slavery after moving to Florida? And was his wife enslaved as well? I’ll need to do some research on this John Roberts character in Jacksonville. Perhaps details about his plantation will direct me to the details that will fill in these gaps. And speaking of traveling (was I at some point? ), these new insights have added at least two more trips to my agenda, keeping in mind my agenda has become more of a long-term thing. Cuba (Matanzas in particular) and Mozambique, since it seems the most common route from southeastern Africa to Cuba was from Mozambique to Havana. Perhaps this is wishful thinking. But who knows what kind of records of the trade they kept in either Mozambique or Havana? I may be getting greedy, but I think I might have a chance to learn James Long’s African name.